For an optometrist having two devices in one makes a lot of sense and a autorefractor keratometer is becoming standard for fixed office located uses, though separate Autorefractors and Keratometer are more common for portable use. 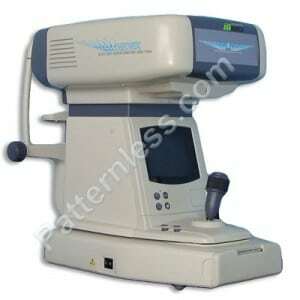 An autorefractor is used to measure the refractive error in a person’s eyes in order to prescribe glasses. A refractive error is where the eye doesn’t focus light correctly leading to a blurred image of either close or distant objects and is measured by a autorefractor keratometer recording how light passes through a patent’s eye and on to the retina as an image is moved in and out of focus in front of the patient. An autorefractor is a computer controlled device and all measurements are taken automatically and recorded automatically, this makes the device easy to use and is ideal for use where there may not be a qualified optometrist. Usually however autorefractors are just the starting point for an optometrist to refine a prescription further by using a series of lenses to test their effect on a patient’s vision: though the auto refractor certainly cuts down the time it takes to complete a standard eye test has can be credited with causing the rise in free eye tests by opticians who can give a test in minutes with the chance of selling glasses as a result. Things to consider with autorefractors however include that their accuracy isn’t perfect and for the most accurate results a cycloplegic agent should be applied to the eyes to relax the cillary muscle: failure to do so may make a patients Myopia (nearsightedness) seem worse than it really is and lead to an in correct prescription if subsequent tests aren’t completed or are hurried. At the same time that the autorefractor part of a autorefractor keratometer is measuring refractive error the Keratometer part of the autorefractor keratometer can take measurements to identify astigmatism. An astigmatism will blur both near and distant images due to the curvature of the eye being irregular and though some people are born with this condition it can result from damage or disease as well. An irregular astigmatism may be horizontal or vertical and can be slight or more pronounced. Once a autorefractor keratometer is used and identifies the problem, having ruled out a general refractive error, the optometrist can create a prescription for glasses or contact lenses having measured the shape of the eye using the keratometer, though surgery is another option. Though keratometers have existed since the 19th century modern autorefractor keratometers are computer controlled for both parts of the measurement, which are usually done with one click and as quickly as each individual test would take with separate equipment. By looking at both possibilities of astigmatism and refractive errors the optometrist can be sure of the cause of any sight problems and may find that both problems even exist and therefore create a prescription that will solve both problems, rather than just one.